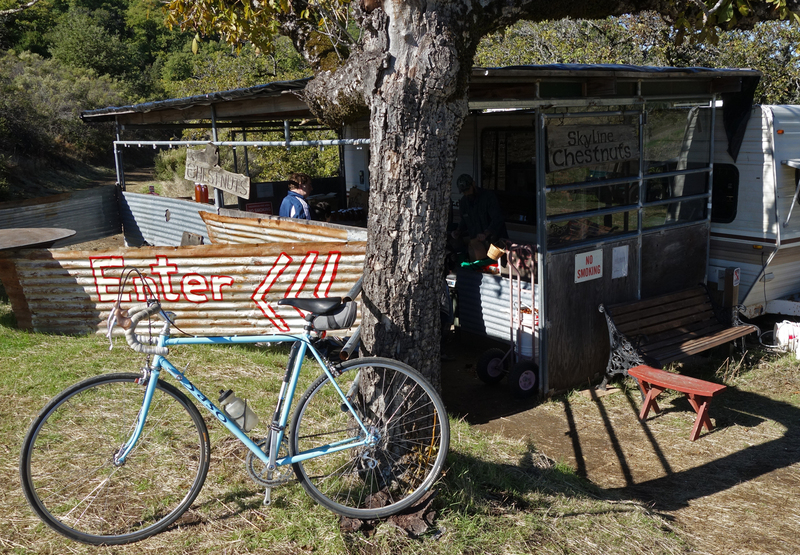 This is the best time to stop and buy some chestnuts on Skyline Boulevard. I can’t tell you how long I’ve known about the chestnut orchard on Skyline Boulevard, but it has been a while. I finally found time and picked the right day to buy some during my bike ride. I had a brief conversation with proprietor Hans Josens about the history of the orchard. He looks like he stepped right out of the mid-1800s, when the orchard was planted. He has taken loving care of the orchard the past 15 years. Josens is no stranger to the Santa Cruz Mountains. His family has been farming here for three generations and managed the nearby cut-your-own-Christmas-tree farm. You’re encouraged to pick your own chestnuts — the ones that have fallen to the ground actually — but I still had some miles to ride so I opted for the chestnuts already gathered up, $6 a pound paid in cash. While we didn’t get into talking about the trees themselves, his website says they’re a combination of European, American, and Asian varieties. The American variety got wiped out by a fungus, mostly back East, but a few orchards like the one here, escaped the illness. When I mentioned I was headed off to look for Chanterelles, Josens related how he found a whole bunch of Morels near Yosemite National Park after the big fire. We bemoaned the lack of Chanterelles in recent years and, sure enough, I didn’t find any. It’s still too early, but I have a bad feeling about this fungi. I think climate change is going to make them a lot harder to find in the years to come. The orchard is located midway between Highway 9 and Page Mill Road on Skyline Boulevard. Be sure to check it out before Thanksgiving day when they’ll close up until next season. Here’s a nice interview recording with Josens on public radio. This entry was posted on November 2, 2016 at 4:20 pm and is filed under Ride reports. You can follow any responses to this entry through the RSS 2.0 feed. You can leave a response, or trackback from your own site.